This week Legoland, California is hosting media receptions for the opening of the newest addition to the park — the Castle Hotel at Legoland. The official opening will be on Friday, April 27, 2018, but Merlin Entertainment’s isn’t wasting any time introducing Legoland’s latest attempt at keeping visitors on-property for the duration of their stays (so Merlin doesn’t lose any vacation dollars to locally owned Carlsbad businesses). The new hotel doubles Legoland’s onsite lodging bringing the park’s room total to 500. Just think, back in 2009 Legoland had to convince the Carlsbad City Council to “change a planning document” to get their first hotel approved. Guess, those changes are working out pretty well now. The three-story, 250-room hotel immerses guests into a creative LEGO® world and every room is fully themed to create a castle fantasy. Guests can choose from three different room themes: Royal Princess, Knights and Dragons and Magic Wizard. Upon entering the LEGOLAND Castle Hotel, guests will first step into a Grand Hall where they are met by a LEGO wizard before taking a magical levitating lift (elevator) that will take them to one of three different floors to continue their adventure. With a place like this to stay, and eat, and sleep, and shop, why would anyone want to leave? Exactly. 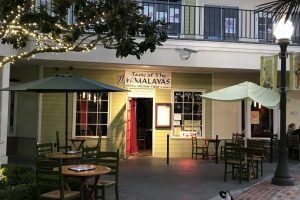 For years the Village of Carlsbad had a reputation for having a slew of Italian and Mexican restaurants and not much else. Thankfully this is no longer the case. The Village is now home to a great array of dining choices and while we’re not big on restaurant reviewing here at Carlsbadistan, there is one spot that we’ve been loving lately and that is Taste Of The Himalayas. Hiding downstairs and nearly invisible from the parking lot at the Village Faire, Taste of the Himalayas has some of the most delicious Indian food we’ve had in San Diego. Stepping into the restaurant is like leaving Carlsbad and traveling to another country with its own colors, sounds, scents, flavors, and moods. Without giving too much away, we recommend you check it out if you haven’t, and if you have, then you know exactly what we’re talking about. Taste of the Himalayas is open daily for lunch and dinner. For address and directions, click here. For more info, click the link.